Deep rose-pink. Easy to grow. The large bushy plants produce giant trumpet-like flowers. Height 75-91cm (21/2-3'). HA - Hardy annual. 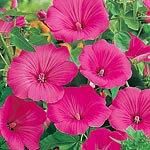 See photos of Lavatera trimestris in real gardens.